A three-judge panel of the 9th U.S. Circuit Court of Appeals has criticized the administration of former President George W. Bush over the practice of detaining suspected terrorists without filing charges against the individuals. This could mean former Attorney General and Missouri Governor John Ashcroft might face personal liability for the decisions. A lawsuit against Ashcroft and other officials was filed in 2005 by Abdulla Al-Kidd, an American citizen who was born Livoni Kidd in Kansas, and who converted to Islam. He was arrested in 2003 while waiting for a flight to Saudi Arabia, and was held for 16 days as a material witness to a crime. He was never charged. Ashcroft has maintained he is immune from such legal action. The U.S. Justice Department says it is reviewing the decision. Former U.S. Attorney and Missouri Governor and Senator John Ashcroft returns to Jefferson City to address Republicans attending the Cole County GOP Lincoln Day Dinner. He spoke of the war on terror, America’s embrace of liberty, and the importance of national security. He praised presumptive Republican candidate John McCain, calling on the crowd of about 300 to work hard for the Arizona Senator’s election in November. Prior to his dinner speech, Ashcroft visited with a couple of members of the media, and was asked which of the candidates for Missouri Governor he would back in the primary. He was non-committal, saying he will support the eventual winner in the fall. As for his suggestions on a potential running mate for McCain, Ashcroft there is a tremendous array of qualified individuals, including Secretary of State Condoleeza Rice, whom he calls "a star in the cabinet." He adds, "She has the capacity to do any job in America." Asked if he would serve if called upon, Ashcroft made it clear he is retired from politics. A major part of each year’s Lincoln Days dinner is the Saturday night dinner with its guest speaker. This year’s event, in Springfield, featured former U.S. Attorney General and Missouri Governor and Senator John Ashcroft. Ashcroft’s speech focused on the importance of freedom. "I believe freedom," said Ashcroft, "Is the single most important value that needs to be reflected in what we do in terms of our elections, in what we do in terms of our governance, because it is at the core of human inexistence and it is the condition which promotes human achievement." Ashcroft went on to speak of the relationship between freedom and security. "I think the role of security," said Ashcroft, "Is to enhance and enrich freedom, not to balance it, not to be a counterweight, but to be its protector and is insurer." The former Attorney General made it clear he believes security measures such as the monitoring of telephone calls to or from terrorist nations is an effort to enhance America’s security and should be embraced. Washington is focusing on what seemed at first to be a simple visit to the hospital bed of former Attorney General John Ashcroft. Alberto Gonzales, who replaced Ashcroft as Attorney General, says he was simply paying a visit to Ashcroft who was recovering from gallbladder surgery. At the time, Ashcroft was Attorney General and Gonzales the White House counsel. Democrats say Gonzales has lied about the visit - that he wasn’t there just to pay a visit, but was attempting to get Ashcroft to change his mind and extend the controversial National Security Agency’s Terrorist Surveillance Program. Ashcroft’s assistant has said that he and Ashcroft had insisted on changes before backing extension of the program. Gonzales has testified in Congressional hearings that he didn’t discuss the program during the visit. FBI Director Robert Mueller and others have contradicted that testimony. Ashcroft is a former United States Senator and Governor from Missouri and lives near Springfield. Former US Attorney General John Ashcroft says his faith has always informed his politics, but has been misunderstood by his critics. 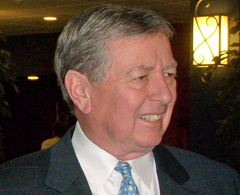 Faith became a focus of the confirmation hearings when President Bush nominated former Missouri Senator John Ashcroft as his Attorney General. Ashcroft says critics unfairly assumed he would use the office to push his Christian faith. Ashcroft says faith is not something government can do for people, but something people must do for themselves. He says it is a relationship not between people and government, but between people and their creator. Ashcroft says he has never had any intention to impose Christianity on anyone, adding that that would be impossible. He does say faith has a role to play in the public square. Ashcroft resigned after Bush was re-elected, saying a second term is a time for a new beginning. He says a president deserves a new team when he begins a new term. Ashcroft runs a consultant company in Washington, D.C. and teaches at Regent University in Virginia. He says he has retired from politics. He was the featured speaker at the Governor’s Prayer Breakfast in Jefferson City, held at the beginning of each legislative session. Former US Attorney General John Ashcroft says America must stay vigilant in the war on terror. 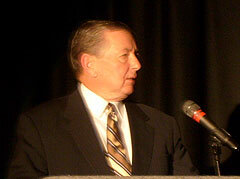 Terrorism was the dominate issue John Ashcroft faced as Attorney General during the first term of President George W. Bush. Ashcroft says though no further terrorist attacks have come on American soil since 2001, the nation cannot afford to become complacent. He notes terrorists adapt to law enforcement tactics, making it difficult to stop them. Ashcroft says terrorists should not be underestimated; that though they might have warped ideas, they often are very smart, many with college educations. Efforts to thwart terrorism have sparked, at times, heated debate in Congress. Ashcroft doesn’t see that as necessarily a break with the unity the nation display after the terrorist attacks in New York and Washington, D.C. on September 11 of 2001. He points out that 89 out of 100 Senators approved reauthorization of the Patriot Act amid much heated rhetoric about its alleged abuse of civil liberties. Ashcroft says the public can play a role, by staying alert and being cooperative with measures to combat terrorism. Ashcroft became Attorney General after losing his bid for re-election to the US Senate in 2000. 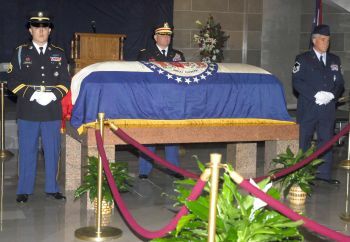 He served as Missouri’s governor from 1985 to 1993. Governor Blunt tells those attending the Governor’s Prayer Breakfast in Jefferson City that faith plays a role in government, but that people of faith must be careful about how that role plays out. Blunt says it’s not wrong to hold to moral certainty, but trouble arises with how people treat those with whom they disagree. Blunt says spirited debate will arise during the legislative session. He says lawmakers should seek common ground and treat those with whom we differ with kindness and respect. Former US Attorney General John Ashcroft, who served as governor from 1985 to 1993, says two voices compete to be heard in today’s society. One says not to worry about the consequences. Ashcroft says the voice of God says to be careful about what you do, because you make a big difference. A new book charges that the Bush Administration had been warned about a possible terrorist attack on American soil and didn’t take the threat seriously. The book by Bob Woodward of The Washington Post has caused quite a stir in Washington and a rash of denials by those in the administration, including former Attorney General John Ashcroft of Missouri. Ashcroft says he never received such a briefing. And, former senior intelligence officials say a briefing about al-Qaida in July of 2001 discussed the possibility of attack, but didn’t provide the nature of a possible attack or whether the attack would take place within the United States or American targets overseas. At that time, al-Qaida had already killed Americans in Yemen, Saudi Arabia and East Africa.